America contained about two and a half million people when we declared our independence in 1776. Today’s Portland, Oregon is bigger than that. The Constitution (1787) empowered every citizen who was white, male and a landowner. Minorities, women and poor people? Not so much. America was unlike Europe in that we didn’t divide our population into nobles and peasants. We divided our people into landowners and land workers. This was different from Europe where the nobles owned the land and the peasants worked on it. You see the difference, don’t you? Three years later (1790,) our first census reported that America had mushroomed to 3,929,000 people; roughly the population of Seattle. But Seattle did not yet exist. It would be another 13 years before Thomas Jefferson would buy the Louisiana Territory and send Lewis and Clark to the other side of the continent to search for Starbucks. They didn’t find it, but they did find enough land to ensure that everyone who wanted to be a landowner could easily become one. “Land? I can own land?” Here came the people. Study America’s history and you’ll find that most of us are the children of castoffs, rejects and refugees. Some of us were even brought here against our will. But that was also true of the original settlers of Australia, wasn’t it? Australia, wow. What a gorgeous place to start a penal colony! If you’re going to banish me, England, please send me there. My own belief is that modern America – America 2.0 – began in 1883 when a 34 year-old writer born in New York City penned a poem to be auctioned in a fundraiser to help erect a 305-foot statue of a woman lifting a torch to the sky; “Give me your tired, your poor, your huddled masses yearning to breathe free…” Emma Lazarus died just 4 years after she wrote that phrase, never suspecting her words would help shape the personality of America for a century. The rest of the money needed to erect the statue was raised by another Jew, a young refugee who had started a little newspaper in New York. His name was Joseph Pulitzer. Jews understand the importance of tolerance. The Dutch understand inclusion. Throughout history the Dutch have been quick to shelter the outcast and embrace the oppressed, so you shouldn’t be surprised to learn that a fifth-generation Dutch New Yorker was President of the United States at the zenith of the “Me” in 1903* when the statue was finally finished and those now-famous words of Emma Lazarus were officially placed on the pedestal beneath it. This visionary Dutchman shut down the power of big corporations to oppress the poor and put an end to child labor. But before he did any of this, his first official act as President of the United States was to invite an African-American, Booker T. Washington, to the White House. Tolerance and inclusion. “I accept that you are different and I want you to be in our group anyway.” This is America. Humility and courage. “I cannot do it alone, but working together, I believe we can.” This is America. Audacity and a sense of humor. As Babe Ruth reportedly introduced himself when he met the Queen of England, “Hey Queen, pull my finger.” This is most definitely America. Emma Lazarus, Joseph Pulitzer and Teddy Roosevelt believed in the beauty, the power and the wisdom of the little guy. They believed in you. The US census tells us there are 5.91 million businesses in America with fewer than 100 employees. 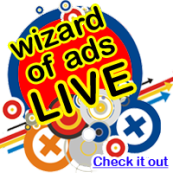 Wizard Academy is a business school created expressly for them. This is where we teach big things quickly, the kinds of things that often mean the difference between failure and success. The American Dream is alive and well and 2012 is going to be a very good year for you. PS – Need proof? Come to Austin. LAST MINUTE NOTE: I just got word from a longtime client and friend of mine in Wisconsin – a retailer who does a few tens of millions of dollars in volume each year – that he just finished Christmas 29 percent ahead of Christmas 2010 which was also a very good year. Many of my Wizard of Ads partners have similar stories to tell. Now what were you saying about the economy? Do you want to know what happened at the auction of that painting by the student of Leonardo da Vinci? Click into the rabbit hole and all will be revealed.